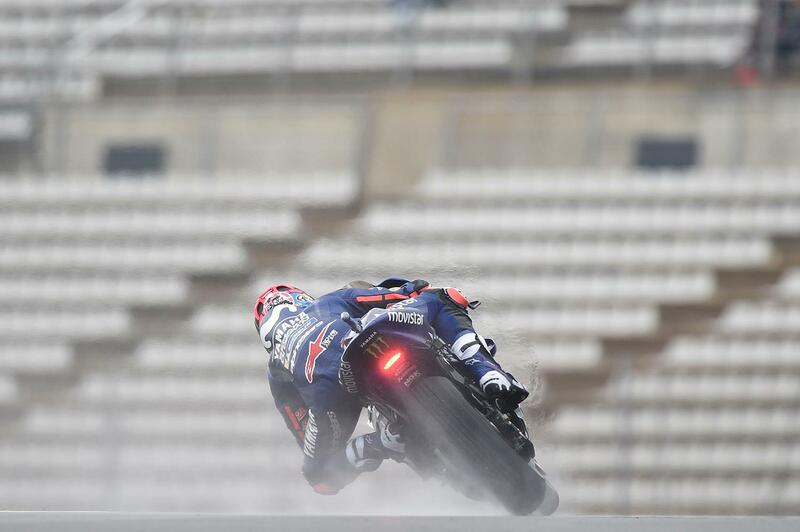 After a sensational final battle for pole in 2018, Q1 graduate Maverick Viñales was the man to take pole position at the Valencian Grand Prix after setting a 1:31.312 lap. This was enough to edge out second place Alex Rins by 0.068 and third place Andrea Dovizioso by 0.080 in a close top three, with the scene set for an awesome final fight of the year. Reigning Champion Marc Marquez, meanwhile, crashed, dislocated his shoulder, then headed back out to claim a miraculous fifth, while Valentino Rossi starts way down in 16th. A piece of history was also made in Valencia GP Q2 as all six current manufacturers finished inside the top eight in qualifying – the first time it's ever happened. It was seven-time Champion Marquez who led the field onto the first flying lap but then at turn four, the 2018 champion suddenly lost the front and went down – seemingly dislocating his left shoulder in the process. Marquez headed straight back to the Repsol Honda motorhome, but soon after he headed back out. Back on track it was Dovizioso who was setting the pace, but then Danilo Petrucci got the better of his compatriot to set the first 1:31 of the session before blitzing the field again on his next lap – a 1:31.531 becoming the time to beat. Then with six minutes to go, a warrior emerged in the form of Marquez as he left pit lane and all eyes were on the seven-time Champion. Before he crossed the line though, Viñales shot to the top to take provisional pole. Red sectors were lighting up the screens in the final minutes of the session though and it was Viñales who went quicker again to make 0.068 his margin at the top, with the miraculous Marquez climbing back up to P3. The World Champion then had a moment at Turn 1 to end his session, but there was still time for change elsewhere as Rins was then threatening to take pole on his final lap. In the end, however, a breathless qualifying ended with Viñales spearheading the grid after his first pole on a Saturday since Aragon last year, with his American Grand Prix pole this season resulting from a Marquez penalty. Rins and Dovi complete the front row, and Petrucci is top independent rider in fourth, gunning for that title on Sunday too. Marquez' miracle top-five performance sees him remain well in the mix, too. Just behind the reigning champion, sixth made it a great day for Pol with the Spaniard just 0.265 from pole in KTM’s equal best qualifying performance. He was just ahead of Q1 graduate Andrea Iannone in seventh, with Aleix Espargaro in eighth the final piece in the puzzle that saw all six manufacturers inside the top eight, split by just 0.318. 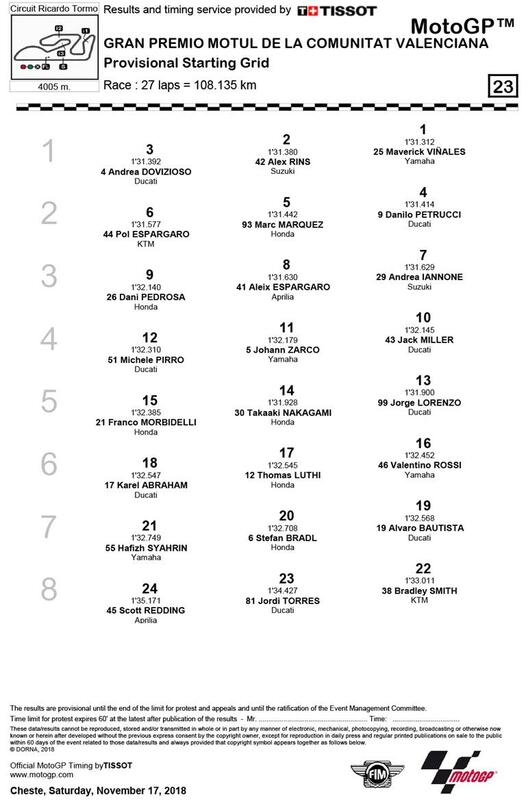 In his final ever qualifying, Dani Pedrosa claimed ninth to start from the outside of the third row after some difficulties in FP4 that affected his qualifying run, with Jack Miller suffering his fourth crash of the weekend to start tenth but automatically through to Q2 once again. While on a lap that was 0.3 under, Johann Zarco also crashed at turn ten to start 11th – rider ok, with Michele Pirro settling for 12th after making it straight into Q2 from free practice.